Discussion in 'The Football Forum' started by tombrown, Feb 12, 2019. Absolutely awesome keeper, I remember that save live, pity we still went down 1-0. Tragic that he was involved in that car crash where he lost an eye. A great goalkeeper who always seemed very likeable and down to earth. 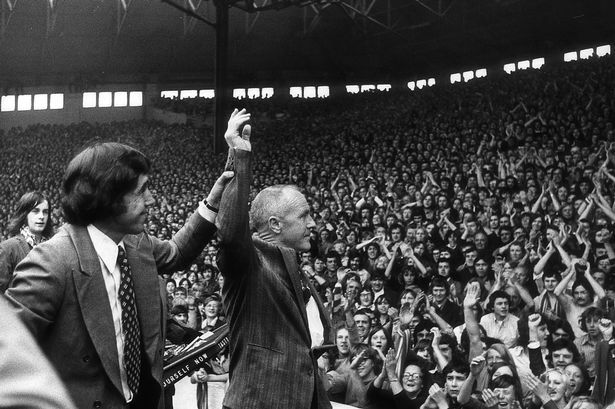 Shankly took him to the Kop when he'd announced his retirement. LarryHagman and Insignificance like this. He was pretty much at the end of his career when I started watching but I recall he was revered as a top 'keeper and of course as a World Cup winner. He was also a real gent whenever people wanted to interview him or just have a chat. In stark contrast to Peter Shilton, who is notorious for demanding certain amounts of money before doing even the most brief and mundane interview. I hope Shilton waived his fees, for once, when he commented on Banks this morning. He was his apprentice at Leicester and learned a lot from him, but, sadly, not his class. Never saw him play live but along with Matthews was one of my dads footballing heroes, heard more than enough about him! "I thought to myself 'that'll do for me'. Liverpool had been a top side for a number of years. "I sat and waited and the weeks went by and I thought they were supposed to be coming for me. "Eventually the manager at Leicester came up to me and said Stoke are interested and would I like to speak to them. So I signed for Stoke." RIP- One of Your best! Three-time World Cup winner Pele said on social media: "I have great sadness in my heart today and I send condolences to the family he was so proud of. "So I am glad he saved my header - because that act was the start of a friendship between us that I will always treasure." LarryHagman, jexykrodic, mark1975 and 4 others like this. The moment after he made that famous save from Pele, his teammate Alan Mullery apparently said to him "Why didn't you catch it ?". JurgenKlopp and Insignificance like this. Possibly an even better save than against Brazil, the speed of the ball and Banks' reaction time to get his hand up to force the ball over the bar. Bloody hell, he hit that hard. Poor penalty, close to the keeper and the right height. He was clearly a fab keeper, and sadly Shilton's rep seemed to ride on his coat tails. Banks was UEFA keeper of the year 6 times, and there was then this seeming acceptance from the English media that English keepers must be the best in the world. No. Banks was the best of his generation in the world and clearly very special. Shilton was a good keeper but there were deffo better in his generation. Yes, I'm obviously thinking of Pat Jennings. Saw him at Anfield once, and one of his teammates got injured in front of the Kop. Trainer, ref, a few others, were gathered round. "Gordon, Gordon, show us his arse !" the scallies sang. Gordon, with that enormous grin, pulled this bloke's shorts down. LarryHagman, gkmacca, Insignificance and 1 other person like this.